When one gives in to the pleasures of drinking a little too much, health is bound to take a beating. Developing chronic drinking dependence makes you susceptible to life-threatening ailments like cancer, cirrhosis. The biggest challenge is to get an alcoholic to admit that he has a problem and get help at the right time. If one is able to take control of their alcohol consumption then there is a chance of protecting oneself from the damage that this habit can cause. You are prone to developing cancer of different organs endangering your pharynx, larynx, liver, oesophagus, breast and the colorectal region. You put the pumping machine of your body at grave risk as chronic drinking puts opens up the Pandora’s box of Cardiovascular diseases. The liver is the most prolific and important organ and plays a vital role in the regulated functioning of major systems. 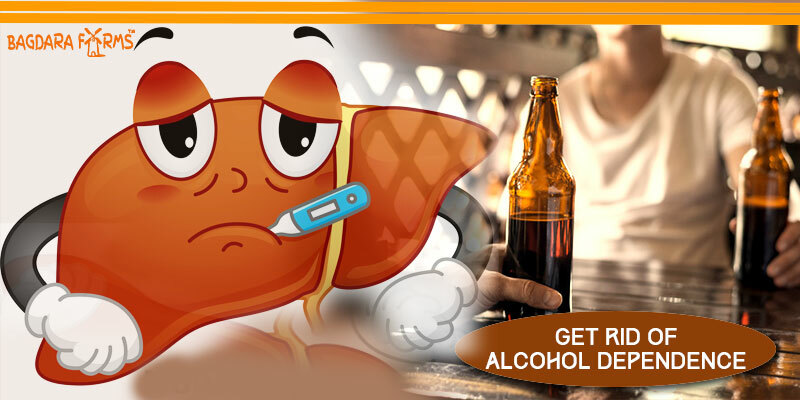 When your dependence on alcohol turns chronic the first organ to take the blow is your liver. Heavy drinking causes inflammation of the liver and overlooking the signs leads to scarring of the tissue leading to cirrhosis. The functioning of the liver is affected due to complications. The first thing that happens is the tissue gets scarred which damages the liver cells and scar tissue is formed. The liver cells multiply to take the place of the dead liver cells. Regenerative modules replace the dead cells. With Cirrhosis the relationship between the liver cells and blood is hampered leading to the blood flow being affected. Even the flow of bile is disrupted. If you have been hitting the bottle too often and you have these symptoms then it is imperative that you visit a doctor before things get out of hand. If the live biopsy does confirm your worst fear then corrective measures are the order of the day. Give these Corrective Measures the Help of Alchorid from Bagdara farms. It is rich in Curcumin, touted as the best its anti-inflammatory and anti-oxidant properties. The anti-oxidant action of curcumin fortifies the liver’s detoxification action thus ensuring all free radicals and toxins are flushed out. Curcumin’s anti-oxidant action also prevents oxidative stress and helps reverse liver damage. The anti-inflammatory action of curcumin lowers the inflammatory enzymes and also checks and controls Hepatic stellate cells, the combined effect reduces inflammation. At times people with a genetic disposition towards this problem and curcumin helps regulate the gene expression which in turn reverses cirrhosis. It has been scientifically proven that curcumin can help moderate oxidative stress levels ( liver) and also moderate genetic symptoms. This action helps protect the liver from any damage. The immunomodulatory action of curcumin also makes your immune system stronger which in turn also bolsters your genetic defences. By bringing down the blood sugar levels Curcumin guards the liver. The combined anti-oxidant and anti-inflammatory action of Curcumin reduce the harmful effects of alcohol thus protecting your organs. With so many benefits Alchorid becomes a must have for all of you who are struggling to get rid of alcohol dependence, but the one thing that one needs to remember is that nothing will work unless you have the will. So if you have the will then Alchorid will help you not just to get rid of the habit but also protect you from the damaging effects of alcohol dependence. how does the antioxidant action of curcumin help in protecting the liver? The problem of fatty liver is caused due to the excessive build-up of fat in the liver leading to the scarring of liver tissue. If left untreated, this condition can even lead to liver cancer and end-stage liver disease. A natural way to deal with this problem is to use Livturm which can help to cleanse off all the fatty deposit from the liver. It also helps to bring down the inflammation in such situations due to the antiinflammatory property of curcumin, which is the main component of Livturm. Similarly, the antioxidant effect of curcumin also comes into play and relieving the symptoms of fatty liver disease. does this product have antimicrobial effect too? Yes, this product has antimicrobial effect too due to the presence of a good percentage of curcumin in it. Many research studies have proven that curcumin has amazing abilities to kill or curb the growth of various types of disease causing microorganisms called pathogens. It also makes the immune system stronger which in turn helps to fight off the microorganisms like bacteria, fungi, viruses etc. Does it help get rid of a hangover after a night of binge drinking? Yes, this product is enriched with a good percentage of curcumin which helps in getting rid of the hangover after a night out of binge drinking. The anti-inflammatory and antioxidant properties of curcumin help to overcome a headache and nausea which is associated with a bad hangover. It also helps to flush out all the toxins from the liver helping in the detoxification process. Is this product effective in treating jaundice caused due to excessive drinking? 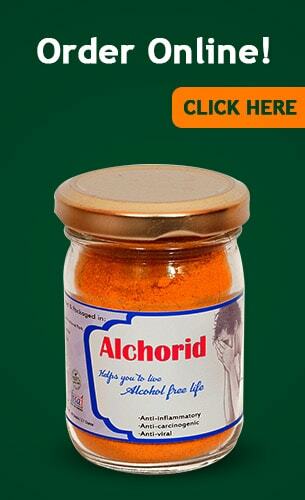 Alchorid is a miraculous product that helps in dealing with alcoholic hepatitis as well as cirrhosis. The main component of Alchorid is curcumin which has multi-benefits in curing issues of liver. It is a natural detoxifier which detoxifies all the toxins present in the liver which is causing problems. It also works by reducing the oxidative damage done to the liver by the virtue of curcumin’s antioxidant action. Since curcumin is antifibrotic in nature, it helps in restoring the condition of the scarred liver tissue. The anti-inflammatory action of curcumin helps to reduce the swelling of the liver tissue due to hepatitis. Curcumin also is antimicrobial in nature which helps infection that can happen in the liver when the immune system is weak due to hepatitis.